Apple’s next-generation iPad, which will likely be announced alongside a refreshed iPad mini in October, will derive its design from the company’s entry-level tablet, according to The Wall Street Journal. The iPad 5, or 5th Generation, will receive a much-needed slim down, eschewing the fat bezels on either side of the 9.7-inch screen in favour of slim, palm-sensitive ones. The body will also be significantly thinner, according to the WSJ, owing to a new film-based touch digitizer, similar to the one found in the iPad mini, that should allow Apple to shave at least a couple millimetres from the body. 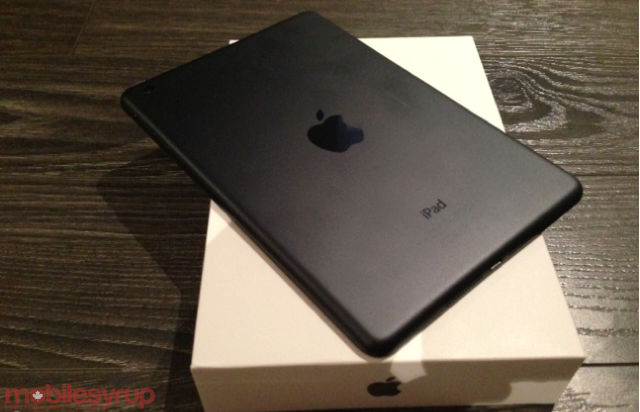 The iPad 3, or iPad with Retina display, was actually thicker and heavier than the company’s second-generation model, owing a larger battery and an increased number of backlight LEDs needed to power that quad-resolution screen. Now that the Retina display is old hat — many of Apple’s competitors have supplanted the 2048×1056 pixel resolution benchmark — it’s incumbent on Apple to tighten, condense and lighten the load. It’s also possible that battery life will be improved in the 5th Generation iPad, thanks to a new screen technology by Sharp called IGZO. This manufacturing method significantly cuts down on power usage, while ensuring the same brightness and viewing angles of previous IPS LCD displays. While Apple’s notoriety as top tablet manufacturer has kept up since the introduction of the 4th Generation iPad last October, the latest counts show Android picking up a decent amount of market share. Apple still holds over 60% of the tablet market, but with successes like Samsung’s Galaxy Tab line and Google’s new collaboration with Asus in the new Nexus 7, an increasing number of users and developers are hopping on the Android tablet bandwagon.